I entered Stanford University’s Computer Science (CS) Department in June, 1966, less than a year after its opening, and remained a graduate student there for the next 6 years. The graduate students in CS came from mixed backgrounds, since there had been no definition of CS until around this time. As I recall the event, Doug was in a chair that had two fixed, flat arms, like the ones you find in schools, except that this chair also could swivel. On the left side he held a mouse, and on the right was a 5-key keyboard. He could type with the 5 keys by pressing one or multiple keys at the same time (this gives you 31 combinations of keystrokes, and some keystrokes changed the “case” to give more options). There was a screen, and the screen contents were also projected onto a large screen that the audience could see. The impact of this demo was not so great at the time. We thought that he had some interesting ideas, such as “windows” that appeared to be sheets of paper overlapping each other on a “desktop.” He also had pull-down menus and something like hyperlinks. Quite far-out stuff. But what made the demo stand out compared to everything else in computing at the time was the fact that Doug – a SINGLE USER – was employing the full computing power of a system running down in Menlo Park that cost hundreds of thousands of dollars. We didn’t think of computers as “personal” in any sense in those days. In 1979, I started working for Apple Computer as a hardware designer on the Lisa team. We initially were implementing a microprogrammed version of UCSD Pascal, but soon dropped the design to go with the Motorola 68000 CPU chip. About this time, Steve Jobs made his now-famous visit to Xerox PARC and came back very excited about the user interface – windows, pull-down menus, bit-mapped graphics – that had evolved from Doug Englebart’s work. The Lisa software team acquired numerous people from Xerox PARC and that led to the second commercial version of Doug Engelbart’s ideas (the first was the Xerox STAR, a $20,000 system). The Lisa (1983) reduced that cost to about $10,000; but it wasn’t until the Macintosh (1984) that Doug’s ideas were found on a truly personal (and affordable) computer. Meanwhile, I spent 10 years consulting for a variety of firms in Silicon Valley. One of those was Quantum, a hard disk drive maker. In 1993, I hired into Quantum to build a new department called Systems Engineering. In 1996, Quantum invited me to join a strategic planning effort that recruited 16 employees – two teams of 8 – to look 10 years ahead and set Quantum’s direction for the future, using a process outlined in Prahalad and Hamel’s book, Competing for the Future. We were encouraged to engage the forward-thinkers of the Bay Area to stimulate our ideas. Remembering Doug Engelbart’s demo, I located Doug and invited him to come to Quantum for a day. By this time, Doug’s office was lodged in Fremont, in a corner of a building where Logitech made computer mice and other gear. Pierluigi Zappacosta, founder of Logitech, was grateful to Doug for his inventions and offered him free use of this space. First, there was what Doug showed as a spiral – the iterative improvement in human capability that comes from improving the tools a person uses. As the tools improve, the person can fashion additional and further-improved tools to keep the spiral growing. Second, Doug was focused on the individual at work, including the ways in which an individual communicates with another individual. In this context, he was the prototype of the original “user experience designer” – a person who is concerned only with how things appear to the user and what the user can accomplish. Third, Doug clearly understood and relied on Moore’s Law, the cost trend that brings double the computing power to a constant-cost chip every 1.5 to 2 years. For Doug, this is what was guaranteed to bring – within a few decades from 1968 –sufficient computing resources at reasonable cost into the hands of the individual. What should we learn from this man’s life? The lives of the heroes, someone once said, are not to be taken as models, but as lessons. Here are some of the lessons I believe we should learn from Doug’s life. A. The life of a visionary is often lonely, because he or she can see what is to come long before others can. In Doug’s case, it took 30 years to arrive at the fruition of his ideas. He was fortunate that he lived to see that arrival. B. Not all visionaries get to run a company and drive it to their vision. Steve Jobs was a rare exception, and even he had real success only on the third try. C. When you’re inventing things, you have to plan to throw away a lot of prototypes. This is a test of persistence and courage. Doug had these traits. D. Ultimate success comes from patient work towards a goal clearly seen. The critical components of such work are the patience and the clarity. 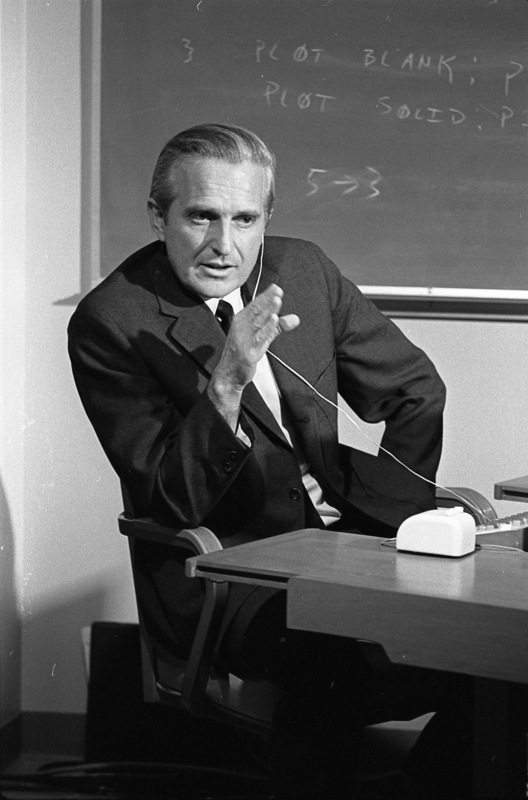 Few of us maintain the level of clarity that Doug Engelbart achieved, and fewer still have the patience to return again and again to the vision. We should all feel inspired by Doug’s life: not by his “success” as measured in the commercial world, but by the example he set of steady vision, patiently explained and consistently followed. Thanks John. That was truly inspiring. One thing though, Doug got all the credit for the mouse as a user to screen/memory content interface, but I worked on a computer system designed by IBM in the 1950s called SAGE or as we called it in the Air Force: ANFSQ7, the NORAD Air Defense Computer (a small part of that computer is on display at the Computer History Musuem). It had a light pen which hooked to the system through a thin cable like the mouse. Out of the end of the pen, instead of a pointer like the mouse, it had a red circle. When the video scanned the screen and the screen scan location and the circle coincided then that character or image was selected and different operations could be selected from buttons on panels hanging off the edge of the screen’s case. Yes, I remember light pens from that era. They were the basis for some of the Ivan Sutherland / Evans & Sutherland work on the West Coast in the ’60s, too. I agree that Doug’s work was not typified by the mouse, but more by his whole approach to use of computers as human augmentation. In fact, Apple made substantial improvements to the mouse (including reducing the number of buttons to ONE), and others developed hyper-links (such as the Xanadu system). We all “stand on the shoulders of those who went before us,” but I think Doug deserves great recognition for his consistent pursuit of better ways to communicate and work. Thanks for reminding us of the earlier work. Everyone should get down to Mountain View and see the Computer History Museum’s “Revolution” exhibit for perspective on computing and how we got here. Thank you for this fascinating story of Doug and his contribution to increased collaboration in teams separated by distance. When I had one precious opportunity to speak with Doug in person he expressed regret that the global collaboration he’d envisioned had not yet manifested. When I told him about working with rooms of 20 people from 6 different countries, and how afterwards they were collaborating virtually – across borders and boundaries of every kind – thanks in part to his pioneering work . . . well, he was visibly moved. I personally feel that global businesses are the perfect laboratory to continue Doug’s “Great Collaboration Experiment”. While governments mainly focus on their own country’s needs, global businesses operate in dozens of countries (UPS has operations in EVERY country! ), and they have a strong motivation to work together profitably, and thus sustainably. Doug wanted to be remembered for advancing collaboration, not inventing gadgets, and that’s how I will always remember him. The seven lessons you summarized at the end are relevant to any discussion of innovation. I particularly like the one about throwing away a lot of prototypes. I question one of your lessons, though: “Ultimate success comes from patient work towards a goal clearly seen.” I wonder how often goals shift in the middle of the process as new things are discovered. So what you thought was a clearly-seen goal turns out not to have been. Thanks for the comments. I agree that, in general, goals shift. However, Doug Engelbart’s goals were associated with ability of researchers (and others) to leverage their knowledge through interactions with computer systems. His way of defining the goals made them something close to universals, in that the measure of success was facilitation of the thought processes or ease of access to what has gone before. This is the sort of goal I believe Doug saw clearly and held to throughout his life.